Vigyan Bhavan Annexe, Maulana Azad Road, New Delhi -110 011. The Ministry of Development of North Eastern Region is a Government of India ministry, established in September 2001, which functions as the nodal Department of the Central Government to deal with matters related to the socio-economic development of the eight States of Northeast India, Arunachal Pradesh, Assam, Manipur, Meghalaya, Mizoram, Nagaland, Tripura and Sikkim. It acts as a facilitator between the Central Ministries/ Departments and the State Governments of the North Eastern Region in the economic development including removal of infrastructural bottlenecks, provision of basic minimum services, creating an environment for private investment and to remove impediments to lasting peace and security in the North Eastern Region. The current, Minister of Development of North Eastern Region is Jitendra Singh (Minister of state, Independent Charge). The Department of Development of North Eastern Region (DoNER) was created in 2001 and was accorded the status of a full-fledged ministry on May 2004. The ministry is mainly concerned with the creation of infrastructure for economic development of North-Eastern region. Main activities/functions of the DoNER. Coordination with the Central Ministries and the State Governments of the NE states. Commerce with South and East Asian nations accounts for almost 45% of India's foreign trade. Myanmar and ASEAN nations are part of India's Look East policy. India is part of ASEAN+6, Asia Cooperation Dialogue, Asia-Pacific Economic Cooperation, Asian Clearing Union, Asian Development Bank, Bangladesh Bhutan India Nepal Initiative, BIMSTEC, East Asia Summit, Mekong-Ganga Cooperation, SAARC, South Asia Subregional Economic Cooperation, United Nations Economic and Social Commission for Asia and the Pacific, Asian Highway Network and the Trans-Asian Railway network. Major initiatives covered are Transport between India and Bangladesh, Bangladesh–India border, India-Myanmar barrier, Bhutan–India border, McMahon Line, etc. NE has 5,000km border with Nepal, Bhutan, China, Bangladesh and Myanmar while being isolated and connected to rest of India by 20km narrow chicken-neck Siliguri Corridor. 13,500 km were NH out of total 3,76,819 km of road length in NE (March 2012). Non Lapsable Central Pool of Resources (NLCPR) plan for NE and Look East connectivity. Special Accelerated Road Development Programme in North East (SARDP-NE) plan for the China border roads. Total approved (A+B): ₹626,000 million (equivalent to ₹660 billion or US$9.1 billion in 2018) (till Dec 2017). A. ₹326,000 million (equivalent to ₹340 billion or US$4.8 billion in 2018) 3,840 km approved and ₹135,000 million (equivalent to ₹140 billion or US$2.0 billion in 2018) 1,266 km completed (2014 to Dec 2017). ₹53,000 million (equivalent to ₹56 billion or US$770 million in 2018) additional funding released to ensure completion by March 2023 of current NE NH projects by plugging the gap, on 100% centre-funding basis, instead of usual 90:10 centre-state funding mechanism (Dec 2017). B. ₹300,000 million (equivalent to ₹310 billion or US$4.4 billion in 2018) additional approved under Bharatmala for NE NH (Dec 2017). Major NE NH route map and SARDP Arunachal roads map. 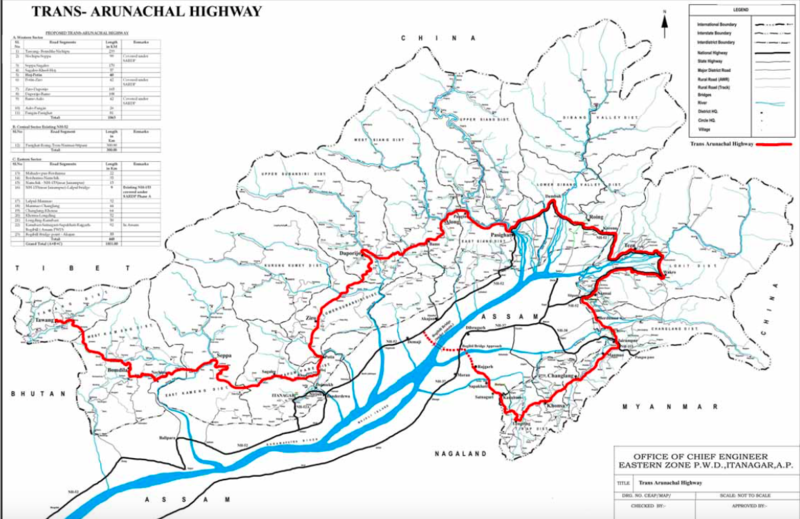 Trans-Arunachal Highway NH13 1,559 km route through the middle via 12 district HQ while connecting the remaining 4 district HQ with link highways, at ₹100,000 million (US$1.4 billion) (c. 2008) under SARDP-NE. NHIDCL launched in 2015 building of 100 strategic 7,000 km long border roads at the cost of ₹800,000 million (equivalent to ₹840 billion, US$12 billion or €10 billion in 2018) across India including in Arunachal(Dec 2017 update). — 73 border roads: incl. Sikkim and Arunachal, all to be completed by March 2022 (June 2017). - 40 in Sikkim under construction (Dec 2017). - North Sikkim (578 meter Theng Pass tunnel on NH310A between Chungthang and Tung) (Dec 2017). Arunachal East-West Corridor along the Assam border in the lower foothills (marked in red) is being taken under Bharatmala project. 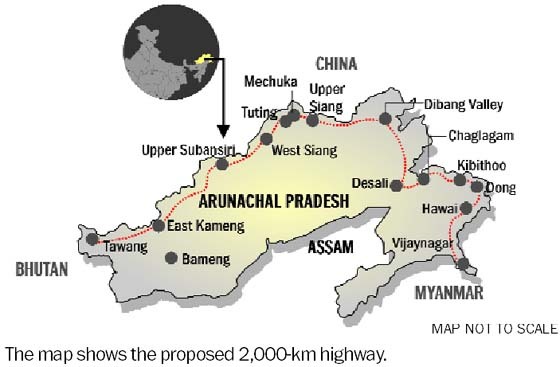 2,570 km approved NH (1917+653 in-progress and completed) in Arunachal, 36% road connectivity, 22 km per 100 sq km Arunachal road density including dirt tracks (c. Nov 2017). 47 new inter-state roads of 1,666 km costing ₹50,000 million (equivalent to ₹52 billion or US$730 million in 2018), of which 4 were taken within plan ending March 2017. ₹5,790 million (equivalent to ₹6.1 billion or US$84 million in 2018) to ₹9,690 million (equivalent to ₹10 billion or US$140 million in 2018) rise in the annual budget. 56 to 138 increase in the number of projects, incl. Bramputra Study Centre established to research river ecosystem. PMGSY roads in NE, including border village roads]. Relaxation to be given to the minimum 250 people habitation in case of villages within 50 km of border. NER railways, In December 2017, 15 new NE railway projects of 1,385km length were approved at the cost of ₹470,000 million (equivalent to ₹490 billion, US$6.9 billion or €6.0 billion in 2018). NER Airports. Indian government was upgrading 12 non-operational airports into operational airports in NE (May 2017, worked started in 8 airports in 2014). LGBIA Guwahati will operate as the inter-regional hub and Agartala Airport, Dibrugarh Airport and Imphal Airport will operate as intra-regional hubs by extending runways and apron, and by building terminal building and maintenance hangars at these airports. 3 new greeenfield under-construction airports are Itanagar Holangi Airport, Pakyong Airport (Sikkim) and Chiethu Airport (Nagaland). Lokpriya Gopinath Bordoloi International Airport, Guwahati modernisation, Chief Minister is also pushing for the converthing this as hub for UDAN and connectivity to at least 9 ASEAN nations (c. Dec 2017). Kailashahar Airport upgrade for UDAN flights, 138 km from agartala. UDAN Phase-I flights started at Shillong Airport, Dimapur Airport, Imphal International Airport, Silchar Airport, Lengpui Aizawl Airport and Agartala Airport. UDAN Phase-II flights started at TBA? India: Haldia Port (West Bengal), Port of Kolkata (West Bengal), Pandu, Guwahati (Assam), Karimganj (Assam) and Silghat (Assam). Bangladesh: Port of Narayanganj, Khulna, Port of Mongla, Sirajganj and Ashuganj. National Waterway 2: Sadiya and Dhubri on Bangladesh-India border 891 km stretch of Brahmaputra River is already operational. 19 additional NE National Waterways under development (as of Dec 2017). NW6: Aai River, Assam, 71 km. NW16: Barak River, Assam, 121 km. NW18: Beki River, Assam, 73 km. NW30: Dihing River, Assam, 114 km. NW31: Dhansiri River-Chathe River, Assam, 110 km. NW32: Dikhu River, Assam, 63 km. NW33: Doyans River, Assam, 61 km. NW38: Gangadhar River, Assam & West Bengal, 62 km. NW39: Ganol River, Meghalaya, 49 km. NW50: Jinjiram River, Assam & Meghalaya, 43 km. NW57: Kopili River, Assam, 46 km. NW61: Kumari River, Meghalaya, 28 km. NW62: Lohit River, Assam, 100 km. NW82: Puthimari River, Assam, 72 km. NW93: Simsang River, Meghalaya, 62 km. NW95: Subansiri River, Assam, 111 km. NW101: Tizu River-Zungki River, Nagaland. NW102: Tlwang River, Mizoram, 86 km. NW106: Umngot River, Meghalaya, 20 km. More potential NER National Waterwaysare being considered. As of December 2017, ₹98,650 million (equivalent to ₹100 billion, US$1.4 billion or €1.3 billion in 2018) power transmission grid project approved in 2014 is being implemented of which 2,540 km lines already laid, and 16 hydro power projects of 5676 MW being implemented and additional 694 MW projects already implemented. Projects include approval of ₹2,070 million (equivalent to ₹2.2 billion, US$30 million or €26 million in 2018) in 2016 to prevent erosion of world's largest riverine island of Majuli, development of Spiritual Circuit in Manipur, Tourist Circuit in Sikkim, Tribal Circuit in Nagaland and Umiam Lake in meghalaya (Dec 2017 update). ^ "Ministry of Development of North Eastern Region" (PDF). Indiabudget.gov.in. Retrieved 15 September 2018. ^ "New Ministers assume office; PM to hold 1st meeting of expanded cabinet". The Indian Awaaz. AMN. Retrieved 22 December 2014. ^ "Non-Lapsable Central Pool of Resources". Pib.nic.in. Retrieved 15 September 2018. ^ "List of ministers in Narendra Modi's government". The Economic Times. 27 May 2014. Retrieved 15 September 2018. ^ "Asia Times Online :: South Asia news - India rediscovers East Asia". Atimes.com. Retrieved 15 September 2018. ^ "Sino-Indian relations". Atimes.com. Retrieved 15 September 2018. ^ "Vietnam among pillars of India's "Look East" policy". English.vietnamnet.vn. Vietnam News Agency. 18 November 2013. Retrieved 18 November 2013. ^ "Modi govt to give greater push to India's Look East Policy, says Sushma Swaraj". Firstpost. 25 August 2014. Retrieved 10 September 2014. ^ "Sushma Swaraj tells Indian envoys to Act East and not just Look East". The Economic Times. 26 August 2014. ^ Administrator. "India's 'Look East' Policy Pays off". Globalpolicy.org. Retrieved 15 September 2018. ^ "Asia Times Online :: South Asia news, business and economy from India and Pakistan". Atimes.com. Retrieved 15 September 2018. ^ a b c d e "NEC Final plan 2017" (PDF). Necouncil.gov.in. Retrieved 15 September 2018. ^ a b c d e f g h Live PM Modi in Meghalaya, Mizoram and North East, Financial Express, 16 Dec 2017. ^ a b c d e f g h i PM Modi approves new central scheme to plug infras gaps for the Northeast, Economic Times, 16 Dec 2017. ^ Arunachal Dy CM Lays Foundation Stone of Bridge over Bari River, North East Today, 11 Dec 2017. ^ Ankit Panda. "Indian Government Plans Highway Along Disputed China Border". Thediplomat.com. Retrieved 27 October 2014. ^ Is hectic highway building in Arunachal Pradesh leading to more landslides?, Scroll, 14 July 2017. ^ Transarunachal highway upgraded, Indian Express. ^ "73 roads of operational significance being built along China border: Kiren Rijiju", The Economic Times, 18 July 2017. ^ Sushant Singh, "China border roads hobbling, 12 years later, 21 of 73 ready", Indian Express, 11 July 2017. ^ India building bridges in Arunachal for LAC access, Economic Times, 18 Dec 2017. ^ "For year-round border security, India plans tunnels on China border. ", Economic Times, 6 November 2017. ^ "Voyants". Voyants.in. Retrieved 15 September 2018. ^ Lessons from Sisen and laptap, Arunachal Times, 14 Nov 2017. ^ a b 12 airports in Northeast India set to get a boost, North East Today, 14 May 2017. ^ a b c d Government Considering Setting up of Three Greenfield Airports in Northeast, NDTV, 13 Aug 2014. ^ a b c d e Steps taken to strengthen North East states air connectivity: Authority of India, Economic Times, 18 Dec 2017. ^ a b c d e f Northeast airports facelift: Government may invest Rs 8,000 crore more, Economic Times, 20 Dec 2017. ^ Guwahati airport to be upgraded for international operations, Economic Times, 19 Dec 2017. ^ China border upgrade: 6 airports in Arunachal, Indian Express, 2015. This page was last edited on 5 December 2018, at 16:14 (UTC).